The area once called Caesarea Philippi is now known as the Hermon Stream Nature Reserve. It is a beautiful area with hiking trails, a river and a waterfall, both fed by snowmelt from Mount Hermon. A seventy-foot-tall sheer rock wall rises above the trees, broken only by a large cave, where in Jesus’ day, a temple of white marble had been erected, dedicated to Augustus Caesar. Visitors today can explore the archaeological site that remains. Visiting or seeing pictures of this site helps clarify why Jesus would choose this particular place for the conversation that Matthew has recorded for us. In such beauty and seclusion, Jesus asks his disciples an odd question: who do people say that the Son of Man is? Jesus is referring to himself with this title, borrowing a messianic term from the book of Daniel where the prophet describes a vision of seeing “a human one,” one like a “son of man” coming before God’s throne. This man was given “rule, glory, and kingship” by God. Daniel says of this man, “his kingship is indestructible” (7:14). To Jesus’ question about the identity of the Son of Man, the disciples reply, “some say John the Baptist, others Elijah, and still others Jeremiah or one of the other prophets.” Since John the Baptist was considered a modern-day prophet, the disciples are acknowledging that many people consider the Son of Man to be a link in Israel’s prophetic lineage. Jesus then asks a follow-up question: “And what about you? Who do you say that I am?” (Matt 16:13-15). Up to this point, Jesus has not identified himself as the Messiah. The twelve have watched him heal the sick, cast out demons, feed multitudes, calm the wind and waves of the sea, and even walk on water. But Jesus has never come right out and said he is the long-awaited Messiah, and the disciples have never asked. Now, Jesus has brought them here, to this isolated place, to ask them this question. I would love to know what went through the minds of the disciples as they surround Jesus with this question hanging in the air. Perhaps they have an idea of the answer, an inkling of who is in their midst, but they don’t want to look foolish or stupid just in case they’re wrong. Surely it doesn’t surprise us that the only disciple courageous and brash enough to offer an answer is Simon Peter. Let’s unpack Peter’s statement a bit so that we can better understand what, exactly, he is saying. First, Peter is declaring that Jesus is the Christ, Christos in the Greek, which is the equivalent of the Hebrew word translated Messiah. It literally means “anointed one.” In the Old Testament, priests and kings were anointed with oil, as were the sacred objects in the Tabernacle and the temple. This act of anointing was a way of setting the person or object apart for God’s purposes. As it related to the priests and kings, it was a sign that the individual had been chosen by God to rule or lead as God’s servant. But while there were numerous priests and kings who were anointed to rule and lead the people, the prophets spoke of an ideal king, one who would rule with righteousness and justice as God’s servant. This hope for the ideal king, the coming king, was not just for an anointed one but the anointed one, and it became particularly pronounced when Israel’s land was ruled by foreign powers, when the people were oppressed, or when the national leaders were turning away from God. Faithful Jews would search the Scriptures for any hint or promise about this coming king who would usher in God’s kingdom on earth. Christ or Messiah was a title that meant the King the Jewish people were waiting for had arrived. You can understand why the disciples might be confused and hesitant to answer Jesus’ question. Yes, Jesus did meet some of the messianic expectations. He called people to repentance, taught them about the kingdom of God, brought healing and deliverance to those who were afflicted. But on the other hand, he showed no signs of raising up an army of rebels to overthrow Rome. In fact, he taught his followers to love their enemies and turn the other cheek and do what the Romans commanded. Was he the Messiah or not? Simon, apparently, had concluded that he was. But Peter didn’t stop by identifying Jesus as the Christ. He also called him “the Son of the living God.” “Son of God” was a royal title. It had been used of David and of Solomon in the Old Testament, not to infer that they were in any way divine but that they had a relationship with God akin to the relationship a son has with his father. Peter, remember, had already fallen at Jesus’ feet twice, both times in a boat, when he saw Jesus do what no ordinary human should be able to do. 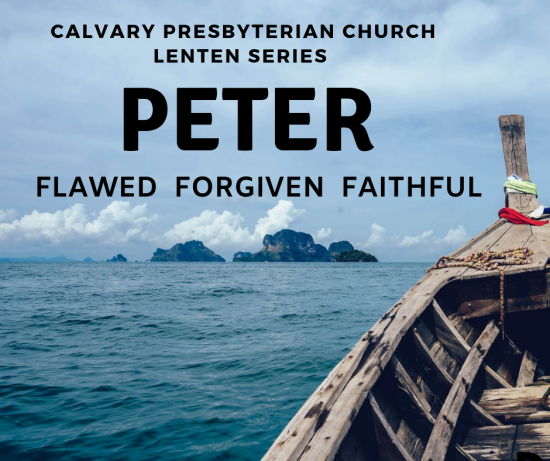 He had experienced the power of God through Jesus, and while it would be going too far to expect Peter to have worked out a clear Christology at this point, it is clear that he saw Jesus as someone who had a special relationship with God, as that between son and father. Which brings us back to the unusual place Jesus brought his disciples for this conversation. He brought them to a city, Caesarea, named in honor of the emperor, in the shadow of a temple dedicated to Augustus. Augustus, during his lifetime and for years after this death, was hailed as Savior, Lord, High Priest and son of a God. Peter’s response to Jesus’ question is a rebuke to these claims about the emperor. Jesus, Peter is saying, isn’t merely a son of a dead god, as Augustus Caesar was. He is the Son of the Living God. Peter is able to articulate this truth about Jesus, but at some level, the disciples all recognized it. When Jesus had, one-by-one, turned to them and said, “come, follow me,” they left everything behind to go with him. Because that’s what you do when you are confronted by the Messiah, the Son of the Living God. Like most things Jesus says, there are layers of meaning to what he tells Peter. The word Jesus uses for church, in the Greek, is ekklesia which literally means “called out ones.” It conveys that yes, while a church building may be made up of real stone, the church is not really a building at all but a community of people “called out” for the Lord. To be the church is to belong to God. It is to be a spiritual house, a place where people can be loved and nurtured as they seek God and learn what it means to live as God’s people. All of us are called to be Petros in some way or other, meant to see ourselves as living stones, the building blocks of a community and a movement through which God is working to heal and transform the world. We continue to lay the foundation upon which the lives and faith of others is being built. Jesus says that the very gates of Hades are not strong enough to withstand the onslaught of the church. In other words, church, I am calling you to be actively engaged in the world, says Jesus. Church, even death will give way when confronted by the power of God. Church, you have God’s Spirit, so get on with engaging the powers of spiritual and emotional death—hopelessness, despair, addiction, oppression, poverty and sin. Can you do it on your own? Not a chance. So, here are the keys of the kingdom. I am giving you authority to teach the Word, to call people to repentance, to practice church discipline. I am giving you a new name, a new family, a new vocation. You are the Church. You are my life in human form in world. I am with you and I will be with you always, so what are you waiting for? It’s time for you to be about my Father’s business. Let me ask you: is that how you see yourself? Are you aware, as you go about your business each day, that you are the rock upon which the faith of others is being built? You are Christ’s body of faith, love and hope? You hold the keys to God’s kingdom? Friends, that’s who you are. You are the Church. You are the walking, talking answer to Jesus’ question, “Who do you say that I am?” Your life is your response each and every day. So today, who do you say that Jesus is?